Kid Cuisine serves up real meals your kids will really eat, and features kid favorites such as All Star Chicken Nuggets, Cheese Pizza Painter, and Twist & Twirl Spaghetti with Mini-Meatballs. With real ingredients, such as white-meat chicken and real cheese, it'll nourish their growing bodies and warm their hearts—and yours. Look for Kid Cuisine® in your grocer's freezer aisle. Real kids. Real meals. Real smiles. Kid Cuisine. Kid Cuisine hit freezer shelves nationwide in 1990 as Kid Cuisine by Banquet. 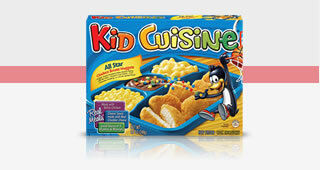 As Kid Cuisine meals evolved, so did the cartoon character—KC the penguin—who represented the fun in every meal. In fact, KC has adopted different looks and attitudes over the years on the way to his current likeness. He's cute and lovable, but like most kids, just a little mischievous. It's not always easy to sit down with your family for dinner—soccer practice, jobs, and homework sometimes get in the way. But studies show that it's worth the effort. Children who eat dinner with their families have healthier diets, greater emotional stability, and better grades. Plus, sitting down to dinner together is a great way to keep the lines of communication open. And stick to it. Let your family decide how many meals to share each week, and then agree to avoid other commitments and appointments on those nights. Even the smallest kids can fold napkins or put a fork by each plate. And be sure to encourage them to help clean up, as well. Try to make delicious and nutritious meals the whole family will enjoy. If you know someone might not enjoy the "main course," try to serve a popular side dish. Make it a rule to leave the TV off and let the answering machine or voice mail pick up the phone. What was the funniest thing you heard today? What was the most amazing thing you learned today? This isn't the best time to discuss issues that could turn into an argument. And remember, spills happen! So don't let a little accident spoil the mood. Remember, family meals may be some trouble at first, but soon you'll find you won't want to give them up. Years from now, you'll be glad you didn't! 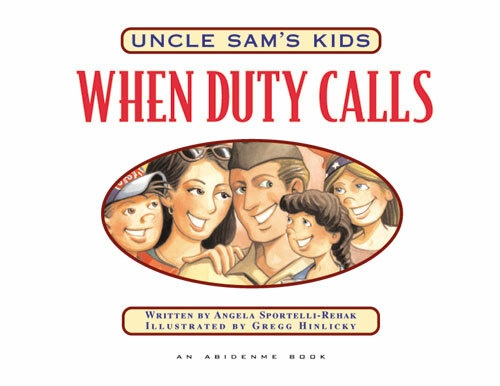 WASHINGTON, April 2008 – Children of U.S. soldiers spearheaded a project to launch a Web site that enables Army youth around the world to communicate with each other. The "Real Teens Connected" Web site, which went live this winter, is a product of the Army's Child and Youth Services Army Teen Panel, and is geared toward teenagers 13-18 years old. The site offers a variety of services to all Army-affiliated youth, including news updates, relocation information and stories written by Army kids. "Kids want to connect with other kids who are in like situations," Pamela "PK" Tomlinson, deputy director of the Army's Child and Youth Services, said. "The idea was a Web site that would focus on linking all teens, regardless of military component, in a venue they are all familiar with and like to use, which is the Internet." A secure online chat room and bulletin board will soon be added. "The reason we wanted to incorporate a secure chat room and a bulletin board is to create a safe site where the teens can talk to each other," said Donna McGrath, a sports and fitness program manager for the U.S. Army Community and Family Support Center and senior adult adviser for the Army Teen Panel. The Web site will allow the teens to express "what it's like to be the child of a military person, and just talk about what's going on with them," McGrath said. "It is absolutely youth led." The idea for the Web site was spawned when Army Teen Panel members came together and realized they needed a way to better communicate with each other. After determining the Internet was the best method to do this, they brought the idea to the adults, Tomlinson said. After the adults agreed about the merits of the project, the teens created a mission statement and marketing plan and designed the registration process, she said. "It's a youth-generated, adult-mentored process that the Army Teen Panel undertook over a period of little less than a year - to develop and come up with a marketing plan and talk about goals and objectives," Tomlinson said. The panel is a group of teens who meet twice a year to discuss concerns that affect Army youth and work on projects to help resolve these concerns. Members of the panel come from active, Reserve and Guard families, and each command and national region comprises the membership, Tomlinson said. The Real Teens Connected project had a "soft launch" at this year's Army Family Action Plan Conference in January, she said, and will be rolled out with more fanfare this month, which is designated as the Month of the Military Child. The Real Teens Connected Web page is hosted through the Boys and Girls Club of America YouthNet Web site, www.bgcayouthnet.org -- first-time users must register there before accessing the Real Teen Connected page. Returning users then just click on the "Army Teens" menu tab and type their user name and password to enter. Eligible youths must also have an Army Knowledge Online account that is sponsored through a parent or guardian. The goal is to have 18,000 kids register on the Web site over the next six months and to eventually move the site up to the Defense Department level, where children of all services and DoD civilians can communicate, Tomlinson said. "Needless to say, we're very excited about this program," Tomlinson said. "These teenagers are really phenomenal kids." where is Mommy or Daddy going? Will we still be a family? The place to come for encouragement! VIRTUAL REALITY – As tens of thousands and active duty, Guard and Reserve servicemembers deploy to the Middle East , their wives are turning to CinCHouse.com for help in coping with marital separation, single-parenting and financial hardship. SAN DIEGO, CA – As tens of thousands of troops deploy from this and other military towns across the United States, their friends and neighbors down the street are joining together to help the families left behind by deployed servicemembers. Resources to help HS students plan for their future. Money, careers, resumes, military opportunities, buying cars, scholarships and dating.